Darren Wilson was never going to be indicted for killing Michael Brown: Our courts don’t hold police accountable for using deadly force. 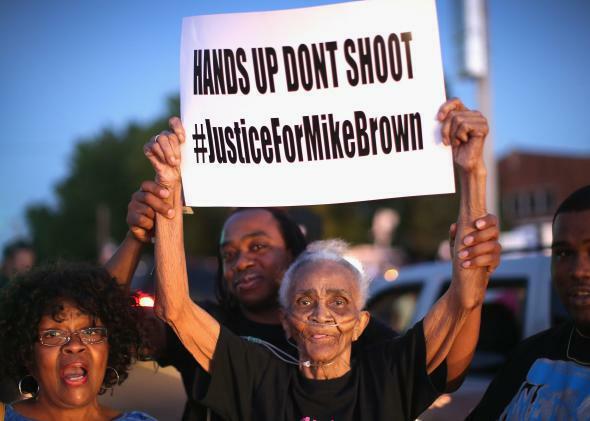 Why Darren Wilson was never going to be indicted for killing Michael Brown. The first Ferguson protests had two slogans: “Hands up, don’t shoot”—referring to Michael Brown’s final actions before he was killed—and “Justice for Michael Brown.” And when you asked protesters what they meant by “justice,” they replied with a plea for accountability. In their minds, justice could only come with an indictment of Darren Wilson, the police officer who shot him. No, he probaby wouldn’t go to prison. But if nothing else, an indictment would show that Brown’s life mattered. That the lives of people like Brown matter. And that their communities deserve answers and explanations for police violence. On Monday night, St. Louis County prosecutor Bob McCullough told Ferguson that after three months of deliberation, the 12 members of the grand jury had its decision: Darren Wilson would not be indicted. In his statement announcing the decision, McCullough explained that the grand jury considered five separate charges—ranging from manslaughter to first-degree murder—and that the jury was convinced by the available evidence that Wilson had reasonable grounds for shooting Brown, and wasn’t liable for a crime. None of this was a surprise. It’s extremely rare for a police officer to face an indictment for a shooting, much less criminal punishment. “The FBI reported 410 justifiable homicides by law enforcement in 2012,” noted Talking Points Memo in an August story following the events in Ferguson, “The number of indictments appear to be minimal after a TPM review of available press reports.” And it’s not just shootings; earlier this year, Georgia police mistakenly raided a home and seriously injured a young child. Prosecutors convened a grand jury, and the grand jury voted against an indictment. “The drug investigation that led to these events was hurried, sloppy, and unfortunately not in accordance with the best practices and procedures,” wrote the grand jury in its decision. Still, no one from the police force was held accountable. Beyond this, there are the general standards for use of deadly force by police, which give wide latitude to officers who use their weapons. The Supreme Court allows police to use their weapons in two circumstances: To defend their lives and to stop an escaped felon. If Wilson believed that Brown was a felon—or committed a felonious offense—then he was justified under existing law. And if Wilson believed he was in danger of losing his life—a belief that only has to be “objectively reasonable,” not likely or even possible—then, again, he was justified under existing law. When you add this climate of legal deference to the particular circumstances of the grand jury trial—including McCullough’s reputation for supporting police officers, and his decision to avoid a recommendation for charges—the non-indictment was almost inevitable. Barring something extraordinary, Wilson was going to walk free. The judicial system as we’ve constructed it just isn’t equipped—or even willing—to hold officers accountable for shootings and other offenses. Or put differently, the simple fact is that the police can kill for almost any reason with little fear of criminal charges. Which is to say this: It would have been powerful to see charges filed against Darren Wilson. At the same time, actual justice for Michael Brown—a world in which young men like Michael Brown can’t be gunned down without consequences—won’t come from the criminal justice system. Our courts and juries aren’t impartial arbiters—they exist inside society, not outside of it—and they can only provide as much justice as society is willing to give. Unfortunately, we don’t live in a society that gives dignity and respect to people like Michael Brown and John Crawford and Rekia Boyd. Instead, we’ve organized our country to deny it wherever possible, through negative stereotypes of criminality, through segregation and neglect, and through the spectacle we see in Ferguson and the greater St. Louis area, where police are empowered to terrorize without consequence, and residents are condemned and attacked when they try to resist.